THE PUBLIC at The Avon. 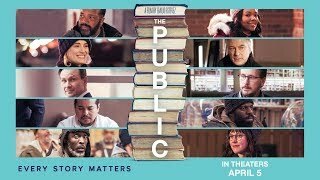 THE PUBLIC is about downtown Cincinnati librarians Stuart (Emilio Estevez) and Myra (Jena Malone) who see their regular winter day shaken up when homeless patrons decide to take shelter in their library for the night. What starts as a peaceful sit-in quickly escalates into a face-off with the police and the media. This David versus Goliath story tackles some of our nation's most challenging issues, homelessness and mental illness and sets the drama inside one of the last bastions of democracy-in-action: your public library.